Saw this idea on Pinterest and thought it was really cute! You take a baby food jar and decorate it like a turkey and then add feathers and write what you are thankful for on them. 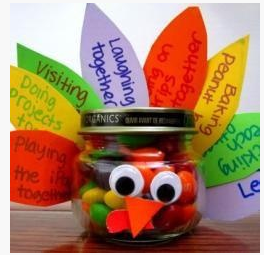 Cute decoration for the Thanksgiving day turkey and you are recycling those old baby food jars too. Don’t forget to add your child’s favorite sweet treat on the inside of the jar for dessert! Do you make something special for Thanksgiving? It’s coming up quickly. One Of My Favorite Baby Items!